Up at 7 o’clock. Very hot all day. Remainder came down from trenches in the afternoon. We marched off to Laviéville1 at night. Went to old billets. Slept on top again. Up at 7 o’clock. Had breakfast. Marched down to the horse lines. Made big shelter with the big waggon sheet and the waggons. Hot day. Very tired. Finished writing little story. Germans shelled heavily to the right and left of us with big stuff. After tea a few squads went up in reserve to the 59th and the remainder of us came back to the château near Fricourt12. Told to be ready to fall in and go up the line any time. Slept with only Lavere again. Slept well. Up shortly after 5 o’clock. Marched up but stayed at the big Canadian dugouts. Went to A.D. station at 8 o’clock. Stayed all night. Built bivouac in the big open dugout. With the stretcher cases and a few walking cases from artillery. Didn’t get down until about 4 o’clock and then slept badly from noise of guns and German shelling. Felt a bit “windy”. Bascombe with me. Up about 5 o’clock. After sleeping very little. Read inscription in Testament on a heap of woundeds’ equipment, From your loving mother Dear Will read a verse every day and God will keep you safe. Mind you say your prayers. Marched back to near the chateau and went to our old bivouacs. Weather still fine. Had bath in a horse bucket. Felt better after it. Newspapers from home and letter from Sandwith. Went to bed about 9 o’clock. Had egg for breakfast then proceeded up to some dugouts near the A.D.S.1 Wonderful places with some long tunnels underground. Some Canadians in them and one sat and told stories. Were ordered up the line at 5 o’clock. Went to Captain King’s dressing station. Nothing for us to do. Sat in the cold all night and managed to scrape about 2 hours sleep. Felt pretty miserable and funky all night. Very few German shells over, but our guns bombarded fearfully all night and the noise nearly deafened us. The 6th Black Watch2 cut up a good lot in the reserve trenches. Lavere and I built a shelter, and then the side fell in and pinned me until I got Lavere to lift off the packs. 7 dead men lying on stretchers outside the aid post. Wrapped myself up in a wounded soldier’s overcoat and ground sheet. Kept awake with, *, guns, *, lice, German shells and nowhere to lie. Got piece of shrapnel out of the L† & Y1 shoulder2. Stayed up until 1.30, then lay down until about 7 o’clock. Had quiet night although the Germans sent over gas shells all the while. Were relieved at 8 o’clock. Marched down to dressing station, then to the billets near the chateau, after calling at an Army Service park. Got to know a big ammunition dump had been fired. Sergeant Jones killed and Sergeant Brown wounded about 8 o’clock. 2 men gassed the night before and a few men down the line. Fine day. Returned to old billets with Lavere. A dead German buried in the side of the trench and his foot sticking out and smelled horribly. Got to know a day or two ago that Ted Trim had got a DCM3 on July 2nd. Received parcel from home and letter from Joe. Had eggs and brown bread and butter to tea. 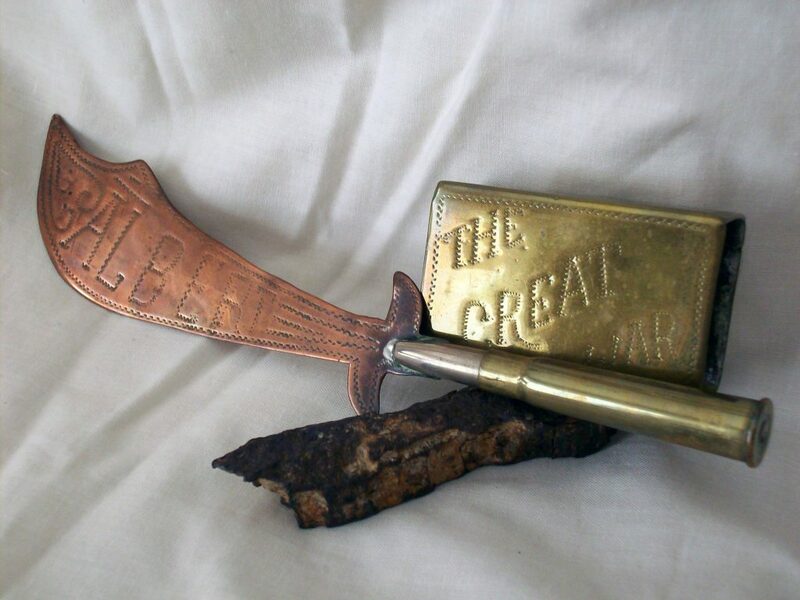 Two pieces of trench art (the matchbox cover engraved “The Great War”; the paper- knife engraved “Albert”, and “Ancre” on the reverse; the handle is a spent .303 cartridge, for a Lee Enfield rifle or a Lewis machine-gun); and a piece of shrapnel preserved by ALL (exact origin not known but possibly related to the July 26 diary entry). Slept badly from lice and a big naval gun. Up at 6 o’clock. Marched up to Captain Johnson for breakfast and had it there. Marched off about 7.30, up to the trenches. Our squad (Bascombe, Houghton, Hall and I) in the aid post near the Bosantine [sic] Wood1. Not much to do all day excepting a few slight wounds and sick cases. About 9 o’clock at night a man walked in with an ugly shrapnel wound in his shoulder, a man with his skull smashed and one with a knee wound besides two smaller cases. Carried the worst ones to the dressing station on the road. Germans shelled all day but stopped while we were down. Had two cases of shell shock in all day. Very heavy journey down with the stretchers. Dark, heavy ground. Only 3 to a stretcher. Got back safely. Sergeant Fraser and Hall went with a walking case and found the German using gas shells. I stayed up until half past one. Arrived at a place about 10 o’clock (23)1 and got down2 with Lavere under a waggon. Ordered to move on again. After delay fell in and marched to the place near the château where we were on Friday. Got down in the open with Lavere and slept well although damp. Got up and had breakfast about 10. Shaved and washed. Washed feet and hunted for lice. Received parcel from home, and letter from home and a letter from Leishman with a photograph of the barracks R-, N.C.Os. Spent day agreeably. Made good shelter for the night. [Above the printed date – ] Heard that Pozières 1 had been captured. About 1 o’clock a shell struck the road about 6 feet off our trench and blew the side in burying Denham and Hughes. A machine gun played over us the whole time and we had to dig them out with our hands. Like a nightmare. Spent a few hours in the proper dug-out. Took down two stretcher cases before breakfast and then got some tea in Captain Newton’s dug out. Duggins and Gibson sent up to relieve Bascombe and I. Received orders later to go down. Paddy and I carried a case to the relief and then came down. Passed an 8” battery. A tremendous number of guns. The bombardment through the night was deafening. Some hideous sights in the wood. An Engineer sergeant badly wounded left to die and was breathing when I saw him last. Also decomposed bodies stirred up with the shells. Up at 5 o’clock and marched off. Felt pretty jaded to start with. Walked up by Mametz Wood1 and to Hardecourt Wood2. Bascombe and I left at the East Lancs aid post. Had our break fast (cooked ourselves.) Other two of our squad there. Took down a man on our backs. Ran some messages to the very heavily shelled sap at night and a machine gun fired over our heads all the night. Took down 9 wounded cases. Carried one on my back. Under shell fire and machine gun fire all the time. Met a Jock with a bad wound in the thigh. A Coal Box3 burst a few feet away from us and nearly blinded us with dirt and fumes but didn’t hurt us. Got him to the King’s Own4 aid post by myself. Returned to rest. Waited until shells eased off. Returned to rest feeling tired and tried to sleep in garments† by position. Shells falling all round us.